The Whisnants have become somewhat of a mainstay in traditional Southern Gospel music. This well-established family group, started in 1970 out of Morganton, North Carolina, has produced ten #1 songs including “Even in the Valley,” and “What You Took From Me.” More recently, they’ve released radio hits such as “I’ll Pray For You,” “King Jesus is Coming,” and “All Is Well.” Recent discography includes Hymns and Harmony--a table project released last year--and More Than Enough, released in 2011. Current group members are husband and wife duo Jeff and Susan Whisnant, along with sons Austin and Ethan and Aaron Hise singing lead. The group’s newest CD, released this month, is titled That’s Why We’re Here, and moves the group away from the huge, orchestrated Lari Goss-produced numbers that led their last mainline recording, and back to the style that brought them to the forefront on Southern Gospel radio. That’s Why We’re Here has its fair share of songs about Heaven, (arguably Southern Gospel’s most popular topic) including the second song “We’ll Meet Again,” (a Palmetto State Quartet cover) “Glorybound,” (a solid upbeat country-tinged song), “Press Along to Gloryland,” and “We’re Going Home.” The third song “I Will Live,” the closest song to a power ballad on this project, also talks about how we will live because Jesus died. 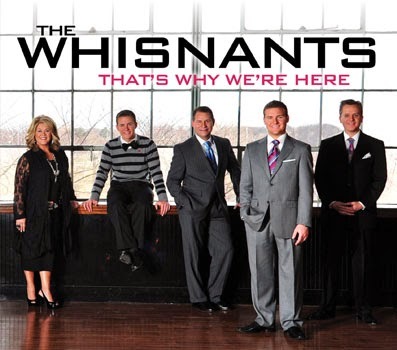 As with their past albums, the Whisnants have secured songs from some of our genre’s most prominent songwriters including Rodney Griffin, Jim Brady (they’ve had great success with the song “All is Well,” which was penned by Jim’s wife, Melissa), Dianne Wilkinson, Lee Black, Jason Cox, and Kenna West. I believe the project could have been better with some more truly unforgettable slow songs, and the addition of a couple power ballads in the tradition of “All Is Well” and “I Will Glory in the Cross.” Of course this type of song can’t carry an album, but they usually are well received. The strength of this album I believe lies mostly in its fast songs, though there are a couple good slow songs too (like “I’m Not Afraid to Trust Him”) that I believe will touch people in a positive way. 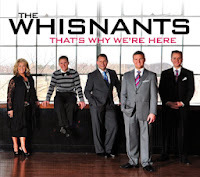 The Whisnants have quite an impressive track record and I look forward to seeing how others respond to these new songs. That’s Why We’re Here is a worthy addition to the group’s music catalog, and fans won’t want to miss this new release. Review copy provided by artist.